Eleven-month-old Zayne Richard is all smiles as he enters the new Novak Center for Children's Health. 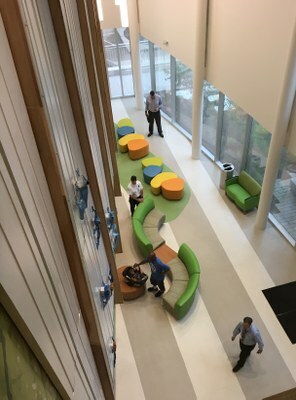 Physicians and other providers at the Novak Center for Children’s Health began seeing patients this week, marking the facility’s official opening. Among the first patients seen in the new facility was 11-month-old Zayne Richard, a patient of pediatric cardiologist Craig H. Alexander, M.D. Zayne was born with an atrioventricular canal defect, which occurs when there is a hole between the heart's chambers and there are problems with the valves that regulate blood flow in the heart. He also has Down’s syndrome. Both basic and clinical research is carried out at the site and will help UofL attract new researchers as faculty. To learn more about the scope of pediatric health care at UofL, including how to make appointments, visit www.UofLPhysicians.org.